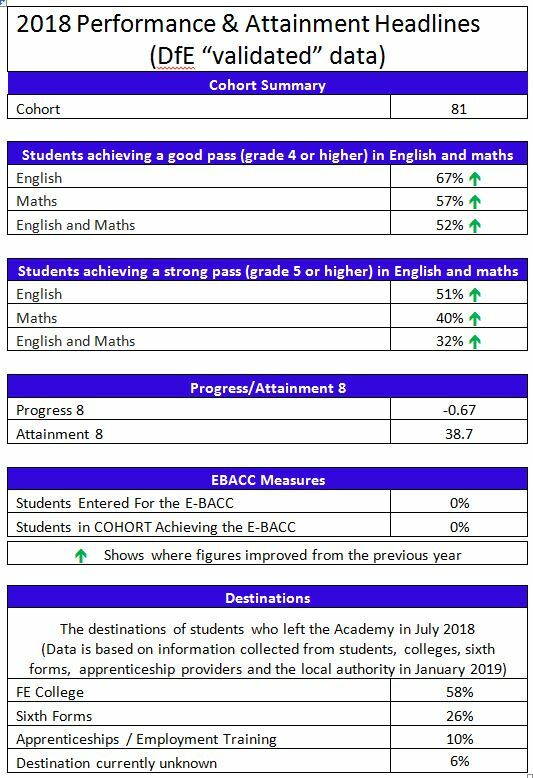 We publish the DfE “validated” data from the 2018 performance tables below. It is important to understand that these tables only include the results students achieved on the “new style” 9-1 GCSEs and the latest vocational qualifications. This is important because the Macclesfield Academy curriculum is different from that in many other schools. Our students take 3-4 of their GCSEs (including all of their foreign language exams) in Years 9 and 10. This means that those who left in 2018 achieved many of the “old style” (grade A*-G) GCSEs. The government tables published in January 2019, did not take these “old style” qualifications into account (even though they are entirely valid qualifications for the students themselves). As a result each of our students had several GCSE passes which are not included in the “validated results” (the blue table). 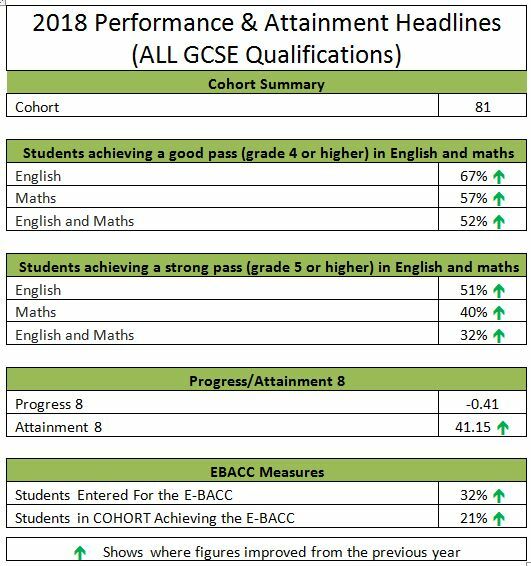 This does not affect the English and Maths results (as these subjects were taken in Year 11) but does make a significant difference to their overall attainment and progress scores and the English Baccalaureate (EBacc) measures. For this reason we include a second table (the green table) which includes all the qualifications the students have taken. When all of the results are taken into account, the majority of our students (those from five of our six partner primary schools) made progress which was at least in line with that of students across the country as a whole. While we are pleased about this, we know we need to do better with those joining us from other primary schools and those who transfer from secondary schools part way through their secondary education. To this end we have a comprehensive set of plans in place across all aspects of teaching, learning and assessment and we are confident that the 2019 results will show even stronger progress by all of our students. However, when they considered the progress made by our students, particularly our disadvantaged students, in the 2017 exams and the attendance of our disadvantaged students, inspectors decided that we were a school which requires improvement. We believe it is unfortunate that the inspectors did not give more weight to the 2015 and 2016 exam results when our students made more progress than those in any school in Cheshire East but, nonetheless, we completely accept that there are, as always, things we need to improve. The full report can be found here. Improve the way that we monitor the implementation of our actions to support these vulnerable children. Parents should rest assured that we will work tirelessly to make these important improvements. In implementing these changes, we will, however, also hold firm to the many strengths of the Academy which the inspectors recognised in the report and which led 95% of our parents to tell them that they would recommend the Academy to a friend. If there is any aspect of the report which you wish to discuss in more detail, please do not hesitate to contact me on richard.hedge@macclesfieldacademy.org in the first instance. I should then be very happy to arrange either a telephone call or a personal meeting to discuss the report further and to explain the changes we are making as a result. Please look at our exam results, our Ofsted report and the school performance tables. However, please also remember they are only part of the story. Please also come and see our staff and students at work and see the powerful attitude to learning that underpins the progress our students make every day. Every day is an open day at the Academy so please feel free to make an appointment to come and see us on any day in the school year.